When you pray, do you expect an answer right away? I remember proudly taking home a personal sized milk carton filled with dirt when I was in elementary school. It wasn’t the dirt that made me proud. It was what was in the dirt. If my memory serves me well, the plant that had shot up from my little plot of soil was that of a bean. Having placed my bean within the unseen darkness beneath about an inch of dirt, I had to wait, along with the rest of my classmates who had done the same with their beans and milk cartons. Though I don’t remember actually doing it, I certainly must have watered it as part of my responsibility as a good student. There was a day when the long awaited sprout peeked out in all it green-ness for the first time. In the following days, it grew to an impressive height. My teacher surely must have told the class that it would be so. "Plant a bean and watch it grow!" Is praying somewhat like the planting of a seed? When we pray, our heartfelt communication with God begins a process. Once thought or spoken, it is instantly acknowledged by Him, although we cannot see it being received. Sometimes, hidden from our view is the beginning of an answer. The seed of prayer begins to take shape as God begins working. What is going on beneath the soil of His sovereignty is too miraculous for us to fathom. If it is God’s will for us to see the answer, there will come a day when a sprout will surface, announcing the response to our prayer. Unlike beans, there is no set time to expect the sprouting of our prayers. God’s timing is unique to each request. There will be some answers to prayer that we can triumphantly carry out into the world and say, "See! Look what God has done!" Other answers to prayer may be granted after we are gone from this earth. Either way, God is faithful. Just as a bean creates a plant, a small seed may create a tall tree. It is for God to decide when and how. He is not slow to hear us. 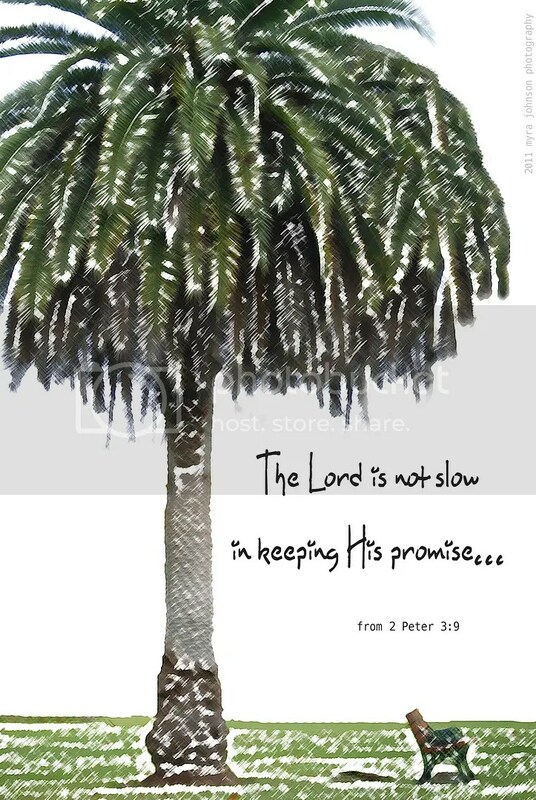 He is not slow to keep His promises.